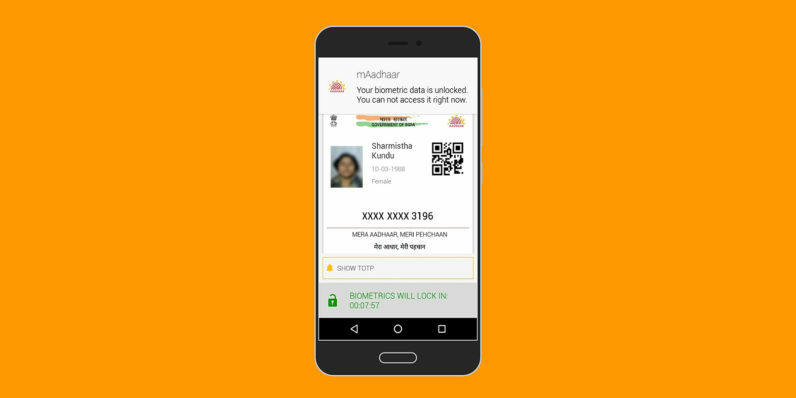 While India is trying to get to grips with the notion of privacy as a fundamental right for its citizens, it’s simultaneously charging forward with its program to document all 1.3 billion people in a biometric database called Aadhaar, and enforcing the accompanying unique ID to things like your bank account and mobile phone numbers. The trouble is, Aadhaar isn’t nearly as secure as it needs to be. Rights advocates have screamed themselves hoarse about the dangers of creating a nationwide database that infringes on privacy, and becomes a massive target for hackers without a clear reason for the system to exist in the first place. As a result, it’s even been called ‘dangerous‘ by experts. And earlier this week, PP Chaudhary, the Minister of State for Electronics and Information Technology, noted that 210 government sites had leaked or openly published Aadhaar number holders’ personal information. The fact that the Aadhaar numbers are on the government website is not a flaw of the Aadhaar system, but it is a flaw of the understanding of what needs to be done to demonstrate transparency. It goes without saying that this massive trove of data could certainly be used against citizens who don’t play by the government’s rule book, even if it’s only to express dissent. And it’s worth noting that the government that’s currently in power and is rabidly pushing for Aadhaar adoption is the same party that fought and mocked it as the opposition in the previous term. According to the Unique Identification Authority of India, nearly 90 percent of Indian citizens are registered in the Aadhaar system. That’s amazing for a program that’s only been in existence for just seven years. But the way the government is achieving this is by making it mandatory for things like filing tax returns and opening bank accounts – despite the Supreme Court ruling that Aadhaar registrations must not be made mandatory for availing of government services. As others interested in technology and policy in India have been saying for years now, Aadhaar reeks strongly of 1984-ish ideology, and the fact that the government won’t address concerns about surveillance and misuse of the database to target dissenting citizens should make anyone uneasy. I’ve been holding off on registering my own Aadhaar ID, but it feels like time is running out. If I don’t get one and link it to my bank account by December 31, my meagre assets will be frozen. It might even become impossible to hop on a domestic flight without an Aadhaar card. It’s unlikely that the government will adequately address these concerns before it becomes impossible to get by in India without an Aadhaar ID, and it feels like all I can do right now is put off my registration until the last possible moment. That’s not how a voluntary system should work. And yet, here I am, wondering if my identity will be stolen once I register for Aadhaar because a poorly built government site left my details unsecured, or if my every move is scrutinized by authorities because I wrote an incendiary article about the ruling party. Tick tock, goes the time bomb clock.